President John F Kennedy was assassinated in Dallas 40 years ago last Saturday. There was shock and disbelief in the United States and around the world. Some compare the impact of Kennedy's assassination to that of the attacks on the US in September 2001. People alive then remember vividly the moment they heard he had been shot, just as people recall where they were when they first found out about the attacks on Washington and New York. Do you have memories of Kennedy? How did his assassination define America? Has it changed the way America sees itself? Although I am too young to remember JFK, I will extol his memory. Kennedy was a true leader and visionary, with a powerful vision for world peace. He stood for everything that the UN stands for, he was truly a man of the future! President John F Kennedy was assassinated in Dallas 40 years ago last Saturday. I was in Coopers and Lybrand (now PriceWaterHouse) when I heard about JFK's death. My shock was, "here goes a good auditor of American Economy". The assassination of JFK had a very devastating effect on the entire American populace. How can anyone say that even one of the conspiracy theories can be laid to rest...when our government still refuses to release the Warren Commission findings!!?? That should be demanded of our government...along with everything else they hide from the people. My memories of John F. Kennedy were that of a dynamic intelligent President. Someone who symbolized the youth of America; especially after the grandfatherly years of the Dwight D. Eisenhower administration. Kennedy's assassination defined America, symbolically and literally, as a very violent nation. Before Kennedy's assassination Americans were quite naive about themselves. Although I was only 11 years old when he was killed, I don't recall Americans seeing the nation in all its violent tendencies and permutations. America's sense of exuberance and vitality vanished with the death of John F. Kennedy. Steven R. Baldari, White Plains, U.S.A. It is amazing how things have changed since 1963. JFK is like George Bush in many ways. The difference is that he was applauded for, being from an affluent and political family, winning a close election, proposing tax cuts, confronting our enemies, and trying to replace a hostile regime that threatened US security. If JFK were alive today he would be called a radical right wing cowboy like our current president. Maybe in 40 years people will appreciate George Bush. I remember Kennedy's prophetic speech in Berlin, in mid-1963, predicting the inevitable fall of the Berlin Wall. When I was assigned, as a member of the U.S. Army, to duty in the then West Germany, in early 1964, I was touched by the genuine affection Europeans in several countries had for Kennedy. It was one moment when we Americans were at our best. Regrettably, Kennedy's type of leadership is not leading us today. I was a student of third year engineering at Peshawar University in Pakistan when I heard the news of Kennedy's assassination. It was unbelievable. Kennedy was a symbol of human dignity and virtue. I was especially grieved because, as a true friend of Pakistan, he offered the then President Ayub Khan, an agricultural development programme, a part of which was the introduction of Agricultural Engineering in Peshawar University. I was looking forward to great strides in relations between Pakistan and America when suddenly the sad news created a void. I was 15 years old and Friday was the night when I went to the Boys Brigade meeting at the local Methodist church. I was at home when I heard the news bulletin which announced that he had been shot, but not the tragic outcome. The news of the President's death was announced by the Boys Brigade Captain, and as we stood in line while the Captain said a prayer, I felt a shock and numbness never felt before in my life. For me the assassination was a pivotal point in my growing up. Overnight I was transformed from an innocent and idealistic youth to realise that there was more evil in the world than I had thought. I was 13, living in Northern Ireland on Friday Nov 22nd, 1963. Our family were watching "Take Your Pick" with Michael Miles when ITN news service broke in to let us know that JFK was dead. Being Irish we had a special affection for JFK, and we were distraught at the news. It felt as if we had lost a family member. JFK was a flawed man, like us all. But he too was a visionary. His speeches were spoken with such belief and vigour that they still haunt politicians today. He was intelligent, articulate, handsome, and humorous. He was America's last great leader. But clearly the most important element of his leadership can be seen on this very web page. People all over the world, who lived during and even after his own lifetime, have been profoundly affected and interested by him. He inspired hope. I was in the sixth grade. We were studying Spanish and we were scheduled to view a televised language course that afternoon. When the teacher switched the TV on, the news was broadcast instead of the Spanish course, so we saw the live broadcasts from the time they broke into the regular programming to announce that the President had been shot. We didn't know at that time that he had died. I remember both students and teachers silently weeping while watching that broadcast. None of us will ever forget those days that followed. I was 9 when President Kennedy was shot and living in a suburb of Washington, D.C. Because our TV was broken and because we lived so close to Washington, we went to the ceremonies surrounding his funeral including when his casket was carried into the Rotunda and when his casket was taken across Memorial Bridge to Arlington Cemetery. The day of his burial was a very cold, clear day and the city was silent except for the sounds of the drums and the marching of soldiers and the horses pulling the casket, and then the salute of the guns and the planes flying across the sky. I remember as a 10 year old watching TV and on hearing the news, going downstairs a little naive and into the waiting room of my father's veterinary surgery which we lived above. 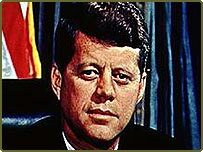 When I repeated the news that President Kennedy had been assassinated I probably was not aware of the significance of the tragedy, but remember the total shock and disbelief of everyone hearing the news from a small boy, although it was only later that the news confirmed he had been murdered. I saw this short film when I was 14 years old in Gia long high school in Saigon. That was a big shock for my youth at that time and from that day, his picture with John junior is always in my mind and my heart. They are a part of my life and I never forget. I have kept all the pictures and the stories of this family from Times and Newsweek magazines in a best place in my house. The photo of the President Kennedy is always in my purse. My people have said that if he had not died, our Vietnam would not fall in such a long terrible war. I love him so much. I remember just where I was when I heard he had been murdered. I was in the quadrangle at High School. My first thought "My God, Johnson is President." I was fifteen, living in Shoreham by Sea, West Sussex. I went out to the neighbours and friends house to confirm the Newscast of Kennedy's death. We really couldn't believe it. He was held with such great esteem. I don't ever remember any American that was so genuinely loved by the English Public. Great Times: We were watching the Civil Rights movement unfold in the South. First trans Atlantic satellite TV, grainy pictures of the Funeral. The amazing botched cover up. For me at that age innocent times had finally come to an end. I had become painfully aware that there were really bad people out there. And of course I would never fully trust the Government or Politicians. I was sitting in Miss Kitzmiller's 5th grade class, just after lunch. The principal announced over the PA that the president had been shot. Our teacher began to cry. A girl from the back asked why she was crying since she hadn't supported him. She replied simply 'because he was our President'. No matter JFK's or his family's faults or crimes, they killed the symbol of American democracy. Instead of an elected President, we received one chosen by a bullet who gave the assassins the war they so dearly wanted. Our country began its slide into 'our long national nightmare' at that moment. I was in my 4th grade when I heard the news in a small town, in my country - Ethiopia. Because of the Peace Corps, I heard, read and saw films about him. I felt like my close family was killed. I am still sad and angry why such a compassionate, visionary and young leader should be killed. Now I am in Dallas, and I often go to the very place he was killed, walk around his statue, remembering his speeches and graceful personality I heard and saw in films and life-magazines in my tender age. I come from a military family. My father was a pilot who participated in the Bay of Pigs invasion. In the days following I remember listening to my father and some of his fellow pilots discussing the assassination. I distinctly heard one of them say, "let's make a toast. Here's to the assassin." Then the rest followed with, "To the assassin." Recalling this later in life I asked him about it and he replied that he didn't know I had heard that. He went on to explain that there were bitter feelings in the armed forces and free Cubans over the way JFK handled the Bay of Pigs. He said that JFK's indecisiveness doomed the operation. He said he wasn't surprised that JFK was killed. I was in high school at the time of his death. While the murder of any national leader is a terrible thing, sainthood for JFK is not appropriate. His death denies us the true test of his presidency - a full term and the historical perspective as to any real accomplishments - and reduces us to inventing a myth to ease the pain of his death. His killer was not the demon he is painted as being (assuming we actually know who he was), and JFK was not a god. He was a real person, with attributes and faults, and should be remembered for what he was, not what we fantasize him to have been. I work two blocks from Dealy Plaza with the old School Book Depository building across the street. Every day, I see people lingering on the grassy knoll. Some are pointing at the window on the 6th floor. Others are standing near the black "X" in the center lane of Elm Street that marks the fateful spot. Sometimes older people are weeping silently. We watched the Kennedy's on TV almost every night on the news. It was a time that seemed filled with great hope and renewal. The entire world mourned the events of November 1963 and America's heart burst with sorrow. Understanding that period of history, it is sobering to realize how close the human race came to an end during the Cuban missile crisis. Things were much worse than the facade had us believe. I was 17 and sitting in school when the news arrived. I learned two things. First, governments are a front to protect the shadowy figures who rule behind the scenes and two, evil seeped into the world of governments and corporations. It was a day that stole millions of people's ideals of justice and fair play. It was a day that marked the rise of greed. I'm 66-years old and I was working in the court house, in Baltimore, when JFK was murdered. Since his death, the country has gone to hell! I think the New World gang ordered the hit on him. It was a coup de tat. JFK was a strong nationalist and a brave patriot. He didn't want the Vietnam War, dubious Free Trade policies, or for Israel to have any nuclear weapons. He had his own money and his own political machine, so he was marked down for assassination. I can't prove it, but that's my opinion on JFK and his death. His killers have never been brought to the bar of justice. I'm a "seasoned" 59-year-old now, but I can vividly remember the events of November 1963. Although I am a Republican, I recall the Camelot years with considerable fondness and fascination. At that time, I was serving as church organist for my parish congregation. A special memorial service was scheduled for the Sunday afternoon following the assassination. I wasn't surprised that the large church was packed during that emotional time. However, the attendees were almost entirely college-age---not the typical age for church-goers, then or now. JFK touched us all, and we haven't forgotten. I recall the great uplift that JFK and his charming family provided for our country. Many of us Americans bought the First Family record album and listened to the humor and joy of a happy first family. I prefer to remember the man for what he gave to our country and the world rather than recall the sad ending of his life. JFK personified a character right out of his "Profiles of Courage" book. He was the right person at the right time, just as he referred to President Lincoln and others. I am 48 years old and I have lived in Dallas all my life. I was in 3rd grade when the President was shot, and I still remember the sadness and the pain that we had lost someone very important to us. I also remember the Principal of our school sending everyone home. I still pass by the Old School Book Depository building almost everyday, and I am reminded of the most terrible tragedy in American history. I was listening to the TV broadcast in the school lunchroom in New Orleans, Louisiana. My family had moved there from Seattle. When the announcement that President Kennedy had died was made all the southern kids got up cheered and celebrated. The people in the south hated Kennedy for trying to bring equal rights to blacks. I will never forget their hate for him all of my life. I was a sophomore sitting in geometry class in Irving, Texas, only a few miles from the site of the assassination. Up until that point, I knew that the world was a fairly safe and orderly place. I knew that assassinations were of McKinley and Lincoln's time, events of the distant past. At 1 pm my high school principal came on the loud speaker with the saddest of voices to tell us that President Kennedy was gone and that my orderly world was in chaos. I find myself with a tear in my eye as I pass Dealey Plaza in my hometown and remember that day in 1963. I remember that young widow with two small children who had to start an entirely new life that day as did we all. Go back and listen to Kennedy's speeches. They sound remarkably similar to those given by President Bush in the last couple years. I guess great leaders are always appreciated better when looking back with some historical perspective. Many protested the policies that Kennedy was arrogantly pushing down the throats of America and the world. And he was right to do so. I was born about 10 years after his death. I feel it is about time that we are given the right to know the real truth behind his assassination once and for all. I wasn't even born when JFK was assassinated but it's one of those events that will forever stay in my mind. When I see film footage or read books I am still shocked by the events of that day. I have my own thoughts on who was actually responsible and I'm not convinced that Lee Harvey Oswald was guilty. I wonder if we will ever know the truth!? I admire America as a Nation for how they have dealt with tragic events such as the death of JFK and September 11th. The Kennedy family have been plagued with tragedy and I hope the so called "curse" has finally been lifted. I was there that fateful day, it was horrible. He was my favourite president. The sorrow of that day (which due to age I do not recall) has to be compounded by the fact that Jackie and John went to their graves not knowing the truth of JFK's assassination. That day changed a country's destiny but the powerful shadow rulers still hold these secrets that will probably never be told. I was 12 when Kennedy was assassinated. I was too young to understand politics. I thought he was very romantic and handsome, and I absolutely loved Jackie and Caroline and John, Jr. It was so neat to have a young family in the White House. When Kennedy died I was devastated. How could something like this happen? I felt so sorry for Jackie and the kids. The way she handled the funeral showed us what a classy lady she was. Even after I found out about JFK's women, I still liked him. His presidency was short but it was a fun time. I'm glad I'm old enough to remember it. I was sixteen years old in school when JFK was shot. It seemed as if the stood still. This one man had made me feel like I was an American. The past was gone and the future was so bright. We as Americans were so respected that the world mourned for our lost. We knew then and know now that the US killed the president. We have destroyed the respect that this country had. If this country is truly blessed we will have in the future another leader like JFK. That's only if we're blessed. I was in my 5th grade math class when a teacher came to the door of our classroom and gave us the news. We were immediately sent home, where I found my Mother watching the coverage on television. I didn't really grasp the significance of it all (I still have yet to do so), although I understood it was a watershed event in my life and that of my country. I remember something else - as a 9 year- old over that long weekend in November 1963, I still went out to play with my friends. The difference was, we acted out the assassination in our play. That still strikes me 40 years later. I was sitting in my 10th grade biology class right after lunch when the announcement was made over the intercom. Everybody sat in silence and my biology teacher just took a textbook and slammed it down on the lab counter in anger & dismay. We were let out of school early and the high school halls were silent as everyone gathered their books & coats and headed for home. For the next 3 days we sat with our families and watched the historic events take place on television. Somehow we felt, without being told, that an "earthquake in history" had just occurred and things would never feel the same again. It sounds trite in saying it now, but it proved true. The 1960s after the assassination no way resembled the tone & feel of 1960-1963. I don't have memories of it myself, but my mom remembers she was feeding me and heard something on the radio. She kept trying to reach the radio to turn it up with one hand, holding me and my bottle in the other hand. She was wondering "what did they just say?" and finally I let out a loud cry. She looked down and saw she had been holding the bottle just an inch or so away from my mouth, and I was red faced with anger at not being given my dinner. She said that was the moment she realized two life changing things: that her newborn had a serious temper, and that they said Kennedy was dead. That's her mental snapshot of Kennedy's assassination. The two things I have mental snapshots of were the Challenger explosion, and 9/11. At the time I was just a young boy. My father and the family were stationed in El Paso, Texas. I remember my father coming into the house with tears and telling my mother, who also started to cry. My mother had only been in this country for two years, she was French. There was so much sorrow. I know now that JFK would have been the greatest leader in the 20th century. I was sitting in my fourth grade classroom at Saint Lucy's in Chicago when the news came to us. The nun asked that we all bow our heads and say a prayer for the President and his family. It was a very bewildering time for us. My most vivid memory was that of the First Lady coming off the plane in her blood stained pink suit and thought she must be the bravest woman ever. Our hearts went out to her and her children. We mourned as a nation, but she mourned as a wife and mother. It was a very sad time. I was in my home room class in the auditorium at school when the teacher came in to announce in a shaky voice that the President has been shot dead. I remember feeling dumbfounded with disbelief and cold all over. All was quiet in the class - no one could really take it in. Everyone knew that Lincoln had been shot, but that was history! This was now and unthinkable. I heard the news of JFK's assassination on my transistor radio while visiting my Grandparents. Later, I vividly remember watching Walter Cronkite crying on TV and thinking that the world would never be the same. The day Kennedy was shot had left an imprint on my mind that will remain with me. I remember my second-grade teacher running into the room, crying, and saying that the president had been shot. We were all told to go home. I lived across the street so the trip home was short. My grandmother lived with us, and we watched the drama unfold on our black-and-white Zenith. When my parents returned from work my mother was in hysterics. I'd never see her cry like this before. It was the first time I'd seen my mother suffer a loss of great proportion. I remember this sense of incomprehensible loss being shared by most adults. It was as if something had died that belonged to everyone. I was living at Rose Hill, Oxford, UK and stationed at RAF Brize Norton a SAC Base, as an Air Policeman. I was working 3 to 11, about 1900 hrs BST, the Strike Team came around and told us the CIC had been assassinated. However we all knew something was wrong before the Strike Team came around, because English Church Bells were ringing from all directions from the country Side. From the way the "investigation" into his murder, the government began losing the trust of the people. Nothing in the last 40 years has given us cause to increase our trust. The current government represents a complete lack of trustworthiness. We were in second year speech class when the principal came on the intercom and told us that the president was dead. Even now, knowing so much more, my age mates recall the tremendous energy, charisma and encouragement that we seemed to find in JFK. It seemed that he was telling us that we could change the world for the good. We bought the package. Later, when we learned of the cynicism and turpitude underlying it all, we sank into our own cynicism and turpitude. JFK has a lot to answer for. My generation of educated white Americans will never take on a president so blindly again. Vietnam, where we buried our friends and siblings, never leaves our minds. I was in six years old when JFK was assassinated, in the first grade. The school was in a state I can only describe as controlled chaos; teachers crying, trying to explain it to us. Looking back, they did a great job. But what I most remember was watching TV through it all. Seeing Oswald shot, JFK's funeral, Jon-Jon saluting his father's casket, all of it still evokes strong feelings of sadness and shock. I'm not sure the country ever really recovered. At the time of Kennedy's assassination, I was in my sleepy hometown of Montecristi, Dominican Republic. I was part of a group of teenagers being trained by members of the Peace Corps on the "building, running, and management" of small scale chicken farms. Well, the Peace Corps was a Kennedy creation; thousands of young, and enthusiastic Americans volunteered for it. They were busy all over the world teaching very basic and needed skills; from English to bookkeeping to building skills to water purification techniques. 40 years ago, our "gringo" instructors, Richard Cabreja, from New Mexico, and "Lucky" Dannon, from Texas, were crying without shame; they really felt distraught beyond explanations. For the next few days we, the young people in their project, became their emotional "nurses". When they were finally able to put their feeling into words it became apparent to us that their were not just mourning the killing of their president, but the killing of so many programs that Kennedy had championed in his pursuit for better US international relations. I was sitting in my third grade classroom in the afternoon when we all heard the announcement over the intercom that President Kennedy had been shot. I remember the deep sadness that came over all of us and many were crying. We all felt that something great had been brutally taken from us. I also remember reading Kennedy's book "Profiles in Courage" when I was young. It is about leaders who stood for their ideals and beliefs, sometimes unpopular, and suffered consequences because of this. A Man who would write this must have been a man of integrity himself in spite of the "human" failings that we learned about later. Kennedy taught me that Great People are also human and are, therefore, imperfect. However, the vision that President Kennedy saw for America is still with us today. I certainly have memories of the assassination and thought naively that US law will eventually catch up with the perpetrators. However recent French journalist discovery on the assassination have shocked me profoundly.